Researchers found right whales south of the Vineyard. With three wind farms already planned for the waters south of the Vineyard, the New England Aquarium has launched a yearlong study to help mitigate the effects of construction on North Atlantic right whales. Researchers hope to create a baseline for understanding marine mammals in the area, including leatherback and loggerhead turtles, but with a focus on critically endangered North Atlantic right whales, whose western feeding grounds extend from Massachusetts to Nova Scotia. The new study could inform the federal government’s decision as to when to allow construction in the Massachusetts wind energy area that begins about 14 miles south of the Vineyard, and a smaller area to the west. Two projects are planned for the larger area (with two leases still available) and and one in the smaller area. North Atlantic right whales are often observed feeding in Cape Cod Bay, but their presence south of the Vineyard came as a surprise to researchers during a four-year study beginning in 2011. Mr. Kraus said the whales tend to move west from the south side of Nantucket, past Martha’s Vineyard and toward Rhode Island in the spring. He said understanding food sources in the area could allow researchers to predict when the whales will arrive and depart. The aquarium will conduct aerial surveys over the next year, using photographs to create a catalogue of individual whales. At the same time, the Woods Hole Oceanographic Institution and Center for Coastal Studies will conduct boat-based research on food density and composition in the area. In contrast, he said, more than 112 right whales — an unusually high number — were spotted in Cape Cod Bay in a single day last week. (One juvenile was found dead and towed into Sesuit Harbor in Dennis on Thursday.) According to the North Atlantic Right Whale Consortium, the worldwide population is around 524 — up from 490 in 2010, although calving rates have declined in recent years. The Massachusetts Clean Energy Center, which is funding and managing the study, has been working since 2011 to examine the barriers to offshore wind development in the state and keep the process moving forward. MassCEC offshore wind director Bill White, who has been visiting the Island periodically since 2009 to conduct public meetings, said it could take years for developers to collect all the data necessary for their permits. He said the group’s advance-planning approach to offshore wind has informed both siting and the federal permitting process and is the first of its kind in the country. The New England Aquarium has been doing aerial and acoustic surveys related to offshore wind development for about six years, but it’s still unclear how the proposed wind farms will affect right whales. 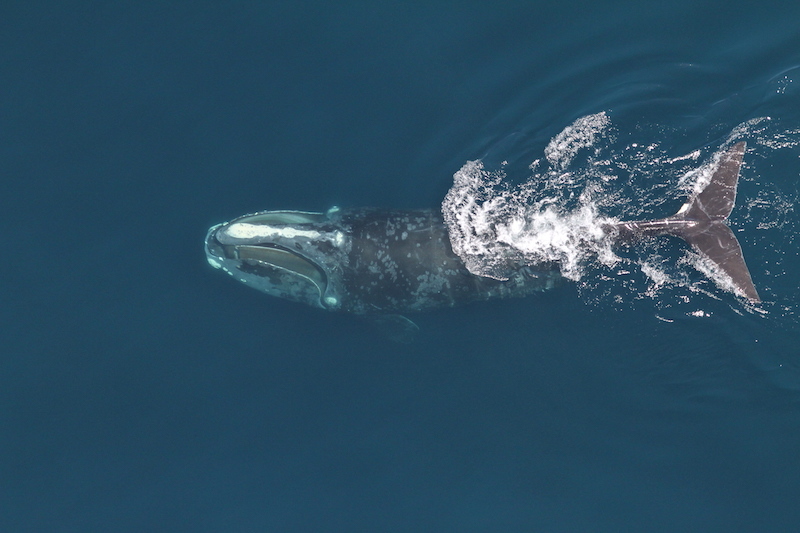 Meanwhile, MassCEC is working with the WHOI, the University of Rhode Island and the federal Bureau of Ocean Energy Management on a pilot study that could provide real-time acoustic data about the presence of right whales. Mr. White said a buoy has already been deployed for the purpose. But for now, he said, the focus is on determining a time-of-year restriction for developers based on the available data. He said the restriction would likely apply from around November to April. "The new study could inform the federal government’s decision as to when to allow construction in the Massachusetts wind energy area that begins about 14 miles south of the Vineyard, and a smaller area to the west." If this is Wind related I'm sure the Federal Government will side with protecting them should the data suggest protecting. Now a NE Oil Rig...well that's a different story. Saw a right whale feeding close to the shore of Duxbury Beach on April 14th.